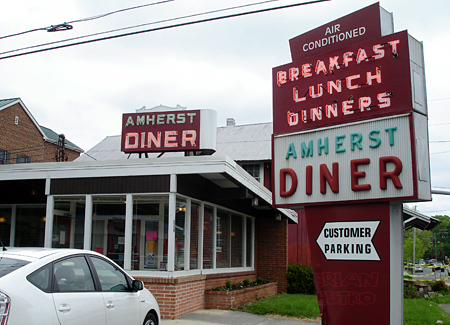 UPDATE: The local newspaper now reports the diner was moved to Pennsylvania. 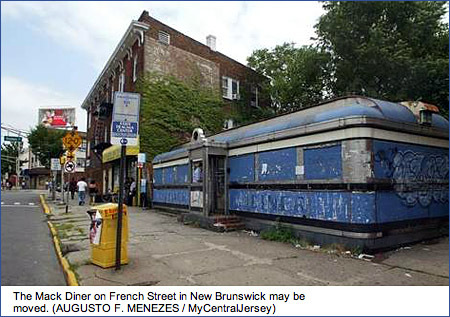 A vintage diner along the Lincoln Highway in New Brunswick, NJ, has been demolished, reportedly on December 7, 2010. 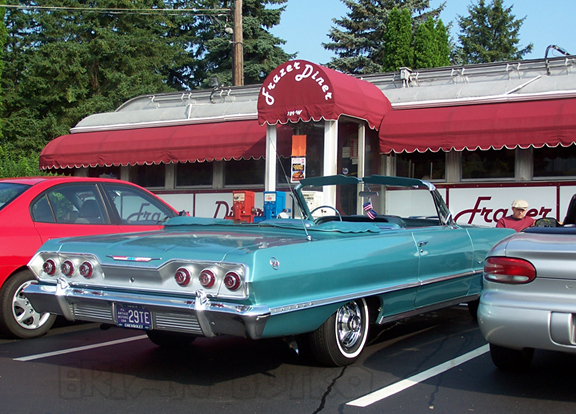 The 1941 Fodero-brand Mack’s Diner stopped serving food in 1968. It became a grocery, then was bought in 1976 for $7,250 and operated as All Ears’ Records until criminal activity closed that business in 2005. Flanked by a record shop and a mini market on French between Seaman and Suydam streets, the Mack’s turquoise shell glimpsed daylight recently. Last month, the advertising posters that have for years obscured nearly its entire facade were taken down. For about a week, the words “Mack” and “Diner,” on either side of the brick and aluminum portico tethered to the patina of decades, were again visible. Inside, what appears to be the diner’s original tile and wood counter teeters against the test of time. But other than the ventilation hoods, stripped of their exhaust fans, little trace remains of the diner’s days and nights as a restaurant. 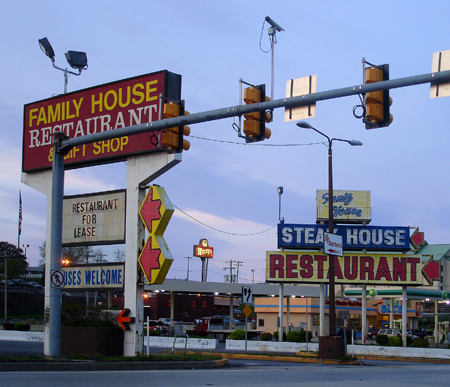 But Algharaybeh, who bought the diner two years ago, says it is otherwise sturdy…. Algharaybeh, who also owns and runs Sam’s Pizza and Chicken two blocks south on French Street, has little use for this period piece. With three years left on the lease for the pizza establishment, Algharaybeh wants to move that business, which he has operated for 20 years at French and Alexander streets, onto the Mack’s lot. A classic diner in California was just used as the setting for a new ad for Apple, maker of computers, iPhones, and iPods. The former Truckee Diner (and before that, the Birmingham Grille when it was in PA), is now Jax at the Tracks, a 1940s diner with a retro redo. It changed owners recently and is now open from 7 am to 10 pm. A good guess might be that the ad is for a notepad computer. Apple has not yet sold one but it seems to be the coming wave in personal computing, sized between a smartphone and laptop. Amidst extreme security, yesterday Apple filmed a new ad at Jax at the Tracks, a hip 1940’s style diner in Truckee, California. Filming on location is a very interesting departure from the usual Apple TV commercials, which are studio based. Some people think this means an ad for a new iPod, but the fact is that nobody has a clue about what this new unreleased secret product really is. Certainly, the security won’t be that high for a new variation of an existing model, but you never know with Apple. Last weekend I drove mostly 2-lane roads to Norfolk, Virginia, and back to Pittsburgh, some 900 miles. 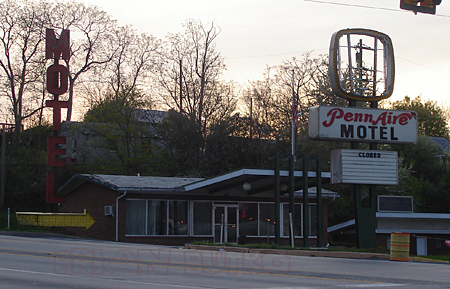 At Breezewood, Pa., a couple long-time Lincoln Highway landmarks were out of business: the Family House Restaurant and adjacent Penn Aire Motel. 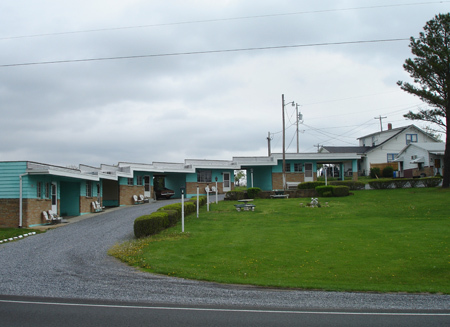 I’ve stayed at the motel and it was fine but certainly on the familiar decline from 1950s fabulous to no-longer-AAA-rated. The restaurant seemed to thrive but Turnpike traffic was noticeably down this trip. On a brighter note, the trip to Virginia included favorite roadside stops like Dinosaurland and some new ones in the Shenandoah Mountains. Flickr friend loungelistener cued me into a couple cool places on US 50 just west of Winchester, Virginia, including the curved-layout Hayfield Motel and the tiny Amherst Diner, where I had a nice breakfast. While researching my Roadside Attractions book, I wanted to stop at Doumar’s Cones & Barbecue, opened 1934 in Norfolk and now I had the chance. 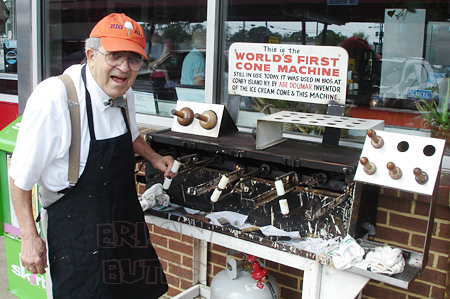 Here’s 87-year-old Albert outside the cool carhop drive-in with his family’s 1905 waffle cone maker! Albert claims it was his Uncle Abe who invented the ice cream cone during the 1904 St. Louis Exposition. With Spring travel not yet here and snow surprising many of us, there’s not much news from the road, but my editor just sent some good news – a few honest-to-goodness samples of my Lincoln Highway Companion book have arrived! These go out to booksellers that want a look before ordering, and perhaps reviewers. I’m hoping to see one too — he says “Looks great!! !” but I’ll still be anxious till I see it myself. Here’s a photo from it of the Frazer Diner that Stackpole Books posted on Facebook. Click it to see it a bit larger. 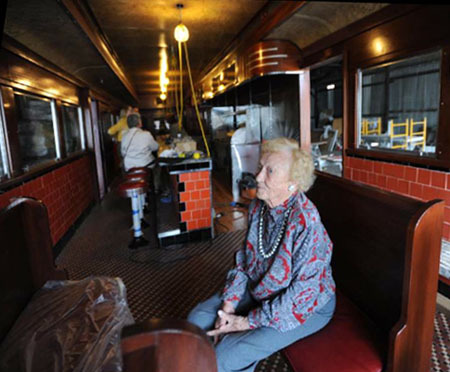 An album from August titled “Death of the Crosser Dinette,” documents its decline. By then, the roof had collapsed, stopped only by the counter, hence the roofline bowing that we reported earlier. You can see water damage and that the wooden framing in the middle was probably not salvageable. The Pierces paid $7,500 for the diner then had to move it, but red tape and a rain storm slowed the 2,400-mile trip through nine states. Then snow collapsed the roof last winter. According to the Jackson Hole Star Tribune, the diner is opening this month, perhaps tomorrow. One of the last free-standing diners in Manhattan, the Moondance served up cheeseburgers, fries, milkshakes and malts to working-class New Yorkers, artists and actors for decades. The diner gained national prominence after being featured in the film “Spider-Man,” and was included as a backdrop in numerous TV episodes over the years. The Moondance became a victim of the times, however, and was scheduled for demolition in 2007 to make room for condominiums. That paper’s photo, below, shows owner Cheryl Pierce with letters stored from the historic neon-lit, revolving crescent Moondance sign. The menu will include traditional diner fare such as burgers, meatloaf, homemade fries, and milkshakes/malts from an antique soda fountain. Those wishing to visit can turn north on US 30 where it famously breaks away from the Lincoln Highway at Granger, Wyoming, between Fort Bridger and Green River, then at Opal turn north on US 189. Diner fan and fanatic John Shoaf couldn’t just read about the deconstruction of the Crosser Diner along the Lincoln Highway in Lisbon Ohio — he had to drive from West Virginia to see the situation for himself. Sorry to say, not only will St. Louis not be getting the diner, but neither will anyone else. John reports that if there ever was a deal to move it, the buyer never showed or paid. The porcelain enameled panels have been taken off and stored, but by now the wooden framing has been burned! WOW!! B.G. Harley’s design used by Sterling is highly evident in what’s left. Each of the four-foot sections is highly visible. The “frame base flanges/bolts” can easily be seen in how it was constructed, with each four-foot section bolted together till the diner was the size you wanted. Interesting even more to me: It started as a CURVED ROOF diner in the plant but was given a flat-ish over roof (using the same wood as the curved part so it wasn’t an after add-on) to make it a later updated squared-off design. The Crosser Diner, which has served the Lincoln Highway in Lisbon, Ohio, for more than half a century, is being carted away. The rare Sterling model at 127 W. Lincoln Way has been closed for years, leading to speculation and concern that it might be demolished. 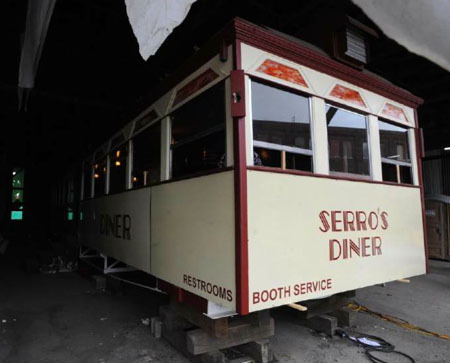 The Lisbon Morning Journal reports that Herb Chesney is disassembling the historic diner for owners Gayle Beck and Paul Hammond, who are salvaging as much of the diner as possible in hopes of reconstructing it just outside St. Louis, Missouri. This photo by Patti Schaeffer is from the December 28 Morning Journal. The Sterling-brand diner was manufactured about 1944 by J.B. Judkins of Merrimac, Mass., best known for their streamliner models featuring one or both ends rounded. This Dinette model is one of only 4 survivors.